This is a post from Fran Szpylczyn who is a writer, graduate of St. Bernard’s, works at Immaculate Conception in Glenville and a friend. Look for her upcoming article in the Times Union and watch this TED talk from Br. 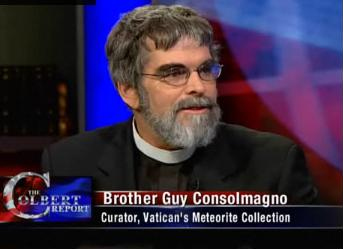 Consolmagno…will get you thinking! When my church nerd and my science geek get going, trust me they get going. Talk about science, I really get worked up when people think that the Roman Catholic Church is anti-science. Without said church there would not be science as we know it… but that’s another story for another day. Prophet to his people during their exile in Babylonia, Ezekiel shared their sense of having been failed by their leaders, who, from David onward, had been ideally cast in the role of shepherd of God’s flock, Israel. As history attests, however, that ideal was not always realized and, as a result, the people of God were left unattended, like sheep left to founder on their own without a shepherd. Right before this reading, Ezekiel reprimands failed shepherds in the past. Only God will restore and lead God’s people to wholeness. It is a message of hope (Preaching Resources from 11/20/2005). Usually we reserve the title, “pastor” for the leader of a religious community. The pastor is to shepherd . . . But perhaps we fail to recognize that every believer is also commissioned, through baptism, to look to the needs of others. We are a priestly people — and priestly people “pastor.” Ezekiel responded to the needs of his despondent exiled community in the early sixth century BC. To encourage them, he presented God as a shepherd. Yahweh would focus attention on the lost, the strayed, the injured, and the sick. Later, in today’s gospel we find Jesus who fulfills this image and also identifies with all those who suffer. What of the reference to goats? Why are goats generally seen as bad in scripture? Goats were often used for sin and guilt offerings. Most Palestinian goats were black (vs the white sheep). Goats often lead the flock, so they can be associated with political leaders; perhaps Ezekiel was comparing the goats to the failed shepherds (Dictionary of the Bible, p. 315). In the Jewish tradition, offering the ‘first-fruits’ of a harvest was a way to bless the entire harvest – a way to consecrate the entire harvest. In Jesus’ death and resurrection, the ‘first-fruits’ of God’s Kingdom, we have the promise and blessing of abundant life in this Kingdom. So death is an enemy that has been overcome! This is an apocalyptic parable. It is about the ‘end-times’ – the ultimate outcome of history. It attempts to give a view of history and humans from God’s point of view. It is about the end times as it challenges us in living as a Christian here and now. As Jesus explains it, there is only one way to exercise power in this world: for the sake of the powerless. Those with food and drink, should share it. Those who are on the inside should be hospitable to those on the outside. If someone is cold, someone with clothes should keep him or her warm. If someone is sick, those who are well should be attending. If people are oppressed, those who have their liberty should look to their needs. If you want to inherit the kingdom, you can do so right now: Put your hat on and go visit the sick Christ. Set a place at your table for the lonely Christ. Forgive, support, or lift up the burdened Christ. Then, the kingdom begins to grow within us – and among us. Sheep came to symbolize honor, virility, and strength. Goats were considered lustful and lecherous animals. Unlike rams, goats allow other males access to their females. Also, goats were associated with sin, for example, the scapegoat (Leviticus 16:21-11) Even in Greek culture, the ram was associated with honorable Greek gods like Zeus, Apollo, and Poseidon, while the goat was associated with Greek gods known for shameful and unrestrained behavior like Pan, Bacchus, and Aphrodite. What is the basis for Jesus’ final, definite determination of in-group (sheep) and outgroup (goats)? Hospitality! The kindness and steadfast love that one owed one’s family was to be extended to others, especially those in need. What’s surprising about the judgment (in Matthew 25) is that neither the good nor the wicked knew that what they were doing or not doing was for Christ. It was just true empathy – feeling with the one in need. Another point about Christ’s judgment — growth in discipleship and living the paschal mystery is measured by the extent to which we look upon the other as Christ, loving the other as Christ, doing for the other as Christ. This is how we come to eschatological joy. This is how we “share in the kingdom prepared for us from the foundation of the world.” Think about it: from the first moment of creation, God planned for us to share in this everlasting joy! The very rich man in this story sounds like an honorable person at the outset. It is only at the conclusion that we learn that he is dishonorable. The 3rd slave even describes him as such, and the rich man agrees with him! The first 2 slaves not only served their master but imitated him. Why not? If you can’t beat the system, join it. The 3rd slave did what most rabbis would later commend as the safest and most honorable course of action for a freeman, but maybe not for a slave. In 1st century Mediterranean culture people believed that all goods already exist and are already distributed. There is no more where this came from, and the only way to get more is to defraud another. Anyone who suddenly acquired something “more” was automatically judged to be a thief. (Pilch, the Cultural World of Jesus, Cycle A, p. 164) So then why is the parable saying the 3rd slave is wrong? It may have been to capture the attention of Jesus’ audience. The message is we are not to be complacent but increase what Jesus has given us. From Celebrations, November, 2002 and 2005: Fearfulness only breeds fear and crippling inaction. If we dare to risk ourselves in loving God and others, then Jesus assures us that we will find a God who is eager to share his powerful presence and gifts. Along with this parable, we need to reflect on the kind of God that Jesus shows us — a God who welcomes sinners and who rejoices when the lost are found. Fr. Richard Fragomeni once said that faith is a risk; it is a bet we make with our whole lives . . .
We can love as Jesus did, fully, freely, and forever – at least, we can try! This would be a great time to talk about the Lateran Basilica if I had ever been to Rome. But I have been to our two churches and I love them. It is a good week to talk about churches as we honor the Mother Church of all Christendom. 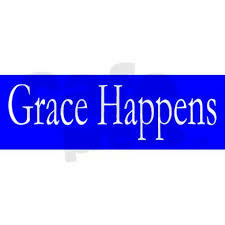 I saw a bumper sticker today that said “Grace happens”. It touched my heart and made me smile. It is so good to stay with those little moments. They are what make or break a day. Because even on the worst days, graced moments happen. A friend of mine, Joyce, calls them ‘God winks’. They are simple, little encounters that move us, make us sigh, speak yes to us, bring inner goodness out. The bumper sticker was unexpected. That particular car happened to be in front of me, and I happened to see it. I told my son Thomas to look at it too. We were on our way to a piano lesson. He was talking about his classes at school and how a boy was teasing him about a girl. I was turning off the radio so I could hear him better. Everyday stuff. Then this bumper sticker pops up. Grace happens. It was like God popping into our conversation to say hi. What a wonderful surprise. Thomas and I began to talk about the bumper sticker and what it meant to us. It morphed into a conversation about the death penalty somehow, but that is a blog for another day. My point is God surprised us, and we happily noticed. Pope Francis says we have a God of surprises. He says, “…God is the God of surprises, that God is always new; He never denies himself, never says that what He said was wrong, never, but He always surprises us.” Do we open our hearts to them? I think when we do, we start to see them all the time. We look for them. We hope for them. We want to make them for others. I bet that’s what the driver of that bumper sticker-ed car thought. I bet she (I say she because the words “Grace happens” were surrounded by pink flowers, but I don’t want to be accused of sexism…she could be a he.) saw God surprises in her life and wanted to join in the fun. It’s contagious once your heart can feel the joy in God’s surprises. Maybe it’s an unsolicited hug, a pleasant comment on Facebook or a smile between strangers. They can be in nature, like geese flying under pink-tinged clouds or a single rose blooming despite the chill in the air. Sometimes they are big surprises. Sometimes they are little. Like the other day, my older son Nolan said he enjoyed the banter going on between his dad and I in the car more than anything else about that outing (God must hang out in cars a lot.). I was pleasantly surprised how much he enjoyed our company. It made all of us feel good, and it carried us through the day. I’m sure I miss a lot of surprises. I let my mind get full of what I need to do, what isn’t getting done. I let myself get distracted. Instead, I need to be present to the possibility of God’s surprises. Notice them. It’s the good stuff of life that brings joy and peace. Before we really begin, how many of you believe you are a disciple of Christ. (A good number of hands are raised.) Good, we were at the Diocesan Autumn Gathering yesterday and someone said that they once asked the people of a really good parish if they thought they were disciples of Christ and no one thought they were. I am glad we are doing pretty well. While I never bonded with Googley, Kate did. She took comfort in the glow of the light of his tank as she drifted to sleep. At other times she just enjoyed watching him. Then one day it happened. Googley died. While I thought, “It’s just a goldfish,” her thoughts were different. She wanted to know when we were going to Gleason Funeral Home and when the Mass would be. Even at the age of 6, she had the need for ritual and community support. While Googley didn’t have the benefit of the Order of Christian Funerals, we did provide Kate with ritual and support. Her friends and grandmothers came over. We lit her baptismal candle, and we wrote memories of Googley on fish shaped paper and pasted it to a larger fish poster. Her friends told her that their Grandfather who had died was taking care of Googley now in heaven. We prayed together. Then we ate goldfish shaped crackers. While Kate was still sad that Googley had died, she appreciated that her friends, neighbors and grandmothers came and made a poster, shared stories, prayed, and ate with her. Now I am involved in funeral ministry. I assist families as they are planning their funerals. One of the interesting challenges I find in working with families who are preplanning are those who have decided to forgo parts of the Order of Christian Funerals. It is common to hear a person say that they aren’t planning on having calling hours or the vigil. There are many reasons we hear this. One of the most common is that they don’t like to go to wakes, so they don’t want others to have to go. I doubt that anyone likes to go to wakes. However, when you are the one who is grieving and you hear a little story about your loved one that you wouldn’t have known otherwise, it makes a big difference that people came. As Catholics, we are called to gently accompany the mourners. When you have been on the receiving end of support provided during the wake, you would never consider taking that away from your loved ones. The calling hours are a time that pictures, videos, favorite songs, and stories can be shared. It can be a time of both laughter and tears. At times we hear from people that aren’t going to have a funeral Mass; instead, they are going to have a celebration of life. In the early years of the Church, Christians joyfully praised God even as they experienced great sorrow at the death of their loved ones. While it is important to celebrate the life the deceased lived, that portion could be done the night before during the vigil. For centuries, the bereaved have taken comfort in the funeral liturgy. The parish priest and bereavement ministers are able to help the family of the deceased with their spiritual and psychological needs. The Mass is one way to accept the reality of death, and comfort one another. There will be a funeral Mass for me when I go. I’m not taking any chances. I’m human, I’m not perfect. I need a few extra prayers to make it into heaven. And heck, if you want to remember me every year on All Souls Day that would be appreciated too! The final portion of the Order of Christian Funerals that some people choose to eliminate is the committal. For families that choose cremation, many believe that committal is optional. While the Church has allowed cremation since 1963, its teaching still calls for cremated remains to be given the same respect casketed remains are given. Keeping cremated remains at home presents a unique challenge. What happens to the cremated remains you have kept at home when you die? Who will get them? Do they want them? There are many permanent options for the burial of cremated remains. These allow for memorialization so that future generations can know you were here. When my youngest lost her beloved hamster Gumball, we went out to dinner with friends to Ferrari’s Restaurant. We prayed, shared stories about pets and people we lost. Mrs. Ferrari sat down, brought the girls dessert and talked about the love of a pet and God’s love. Again, it didn’t make Mary-Margaret’s pain any less, but the ritual was a starting place for her grief. The Basilica of St John Lateran was dedicated by Pope Sylvester on November 9, 324. For nearly 1700 years, it has been the place of numerous worshiping communities, church councils, Bishops of Rome (Popes), fires, earthquakes, wars, barbarians, neglect, and reconstructions! It also has a “holy door” which is opened every 25 years to mark the beginning of the celebration of a jubilee year. It was originally known as the Church of Our Savior. Later it was renamed for the large baptistery in honor of St. John the Baptist that is also located there. It is called the “Mother-Church” because it was the first Christian church to be publicly dedicated. Before this, for almost 300 years, the Roman Empire had tried to wipe out Christianity through many severe persecutions. Then, in 324, Emperor Constantine granted Christians the right to worship publicly. After, Constantine’s conversion, the land and palace of the Laterini family owned by his wife, Fausta, was donated to the Bishop of Rome as his residence. This basilica was then built and dedicated. It became the first official Christian church building. Thus, it is a fitting symbol of our freedom as Christians and the abiding presence of God’s Spirit within the Church, God’s People. We know the church is not the building, but there is something about a holy place that draws us in, helps us feel at home and gives a sense of belonging and unity. What do our church buildings mean to you? Jesus calls the temple “my Father’s house.” This phrase is used 27 times in John’s gospel. In John 14:2, Jesus uses these words to refer to the kingdom of eternal life: “In my Father’s house there are many dwelling places.” What meanings do you attach to this phrase? Later, he then refers to the Temple as the “temple of his body.” How as a Christian do you understand this section?